Decoteau is a future residential area in the southeast portion of the City of Edmonton in Alberta, Canada. It was named on October 28, 2014 for Alex Decoteau, a Cree track and field athlete who competed for Canada in the 1912 Summer Olympics and was also the country's first aboriginal police officer. Located in southeast Edmonton, Decoteau is bounded by 50 Street SW to the west, 41 Avenue SW to the south, Meridian Street to the east and a combination of Anthony Henday Drive (Highway 216) and Ellerslie Road SW to the north. Leduc County is located beyond 41 Avenue SW to the south while Strathcona County is beyond Meridian Street to the east. 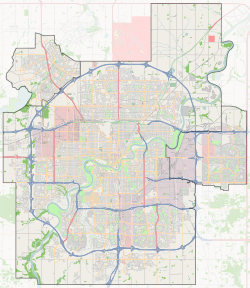 The Southeast Edmonton residential area is located across 50 Street SW to the west, while Mill Woods and The Meadows are located across Anthony Henday Drive to the northwest and north respectively. ^ a b "City of Edmonton Wards & Standard Neighbourhoods" (PDF) (PDF). City of Edmonton. Archived from the original (PDF) on May 3, 2014. Retrieved December 21, 2014. ^ a b "Naming Committee Meeting Minutes" (PDF) (PDF). City of Edmonton. October 28, 2014. p. 2. Archived from the original (PDF) on December 21, 2014. Retrieved December 21, 2014. ^ "City Councillors". City of Edmonton. Retrieved December 21, 2014. ^ "Alexander Decoteau (1887–1917)" (PDF) (PDF). City of Edmonton. May 2013. Retrieved December 21, 2014. This page was last edited on 27 February 2019, at 22:54 (UTC).